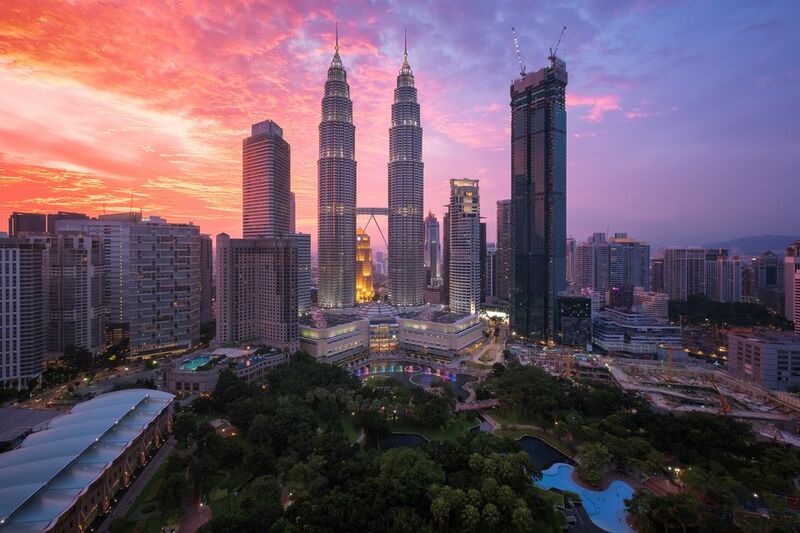 Because of Malaysia's geographical shape and location, seasons differ from one side of the peninsula to the other and across destinations and thus, the best time to visit the country can vary. Overall, the best time to visit Malaysia is between the months of December and February, if you're planning on visiting the islands on the west side of Malaysia (e.g., Penang and Langkawi), or June through August if you're planning to visit Perhentians and Tioman Island, on the country's Eastern coast. The weather is often different in East Malaysia (Borneo) than in Peninsular Malaysia. Even in Peninsular Malaysia, the weather can differ entirely between Penang, a favorite island in the north, and Kuala Lumpur. Except for the Cameron Highlands, where evenings are damp and chilly enough to merit a jacket, Malaysia stays hot and humid throughout the year. The primary concern is rainfall and, in the case of visiting some islands, sea conditions. Kuala Lumpur enjoys a tropical climate: plenty of sunshine and rain with high humidity between showers throughout the year. Don't expect to have a completely dry visit to Kuala Lumpur; rain can come at any time. Even the peak month of July, the country's driest, averages 11 days of rain. Although Kuala Lumpur receives abundant rainfall from the northwest monsoon regardless of the season, the driest months are usually June, July, and August. July usually has the least number of rainy days. The rainiest months in Kuala Lumpur are usually April, October, and November. The driest months in Penang, Malaysia's big island famous for culinary treats, are between December and March. January and February are the most ideal, but they are also scorching hot. Temperatures and humidity climb to three-shower-a-day levels by April. September and October are by far the wettest months in Penang. Malaysian Borneo, or East Malaysia, is the third-largest island in the world and east of Peninsular Malaysia. The weather is most suitable during the summer months (June, July, and August) for taking advantage of the many outdoor adventures on offer. Regardless, persistent rainfall throughout the year keeps the rainforests lush and green for the endangered orangutans there. The wettest months for Kuching in Sarawak are December, January, and February. Rainfall can be incredibly hard, disrupting plans and turning the national park trails into muddy streams. Malaysia's popular Perhentian Islands hit their peak during the summer months; accommodation becomes more expensive and can even fill to capacity between June and August. Travelers to Perhentian Kecil once had to sleep on the beach or with strangers while waiting for rooms to free up. Although visiting the Perhentian Islands during the winter is possible, many hotels and restaurants are closed for the low season. Rough sea conditions can make getting to the islands an unpleasant challenge between November and March. The small speedboats that ferry passengers back and forth have a hard time getting people and supplies to the island. Langkawi or other islands on the west side of Malaysia are better choices when the Perhentians are mostly closed for the season. Popular Pulau Langkawi, Malaysia's busiest tourist island, hits high season in December, January, and February when the weather is best. Although jellyfish are a constant problem for swimmers throughout much of the year, they are mainly a nuisance between May and October. Buy a small bottle of vinegar or ask a restaurant kitchen for help ease stings quickly. Duty-free Tioman Island (Pulau Tioman) on the east side of Malaysia is quite close to Singapore. The driest and busiest months for Tioman Island are between November and March. The island becomes relatively quiet during the summer months when backpackers and other travelers are partying in the Perhentian Islands on the other side of Malaysia. Tioman Island is carved up into many separate, completely different beaches. Even during the busy months, you can find relative peace and isolation. Spring months have calm weather, free of monsoons and strong winds. Rain is typically minimal, but it still can be quite hot and sunny. Bring an umbrella—just in case—and plenty of sunscreen if you're visiting during the spring. Summer is hot in Malaysia and can be quite rainy depending on where you go. From June through August, the country can be affected by the Southwest Monsoon which travels up from Australia. Don't expect a break from the heat or humidity either—temperatures in Kuala Lumpur during the summer months are typically in the 90s, with humidity to match. Hari Merdeka: Celebrated annually on August 31, Malaysia's Independence Day is a festive event with parades, fireworks, and lots of traffic-disrupting revelries. Rainforest World Music Festival: Kuching fills to capacity during this three-day event of culture and music held each summer. Ramadan: The dates for Ramadan are based on the moon and vary from year to year. While you certainly won't go hungry during the Islamic holy month, some restaurants and businesses may be closed, at least until sundown. You should show proper respect to people who may be fasting throughout the day. In early fall, rainfall is minimal, but it's still quite hot. November is one of the country's wettest months, averaging more than 11 inches of rain on average. Temperatures at night are slightly cooler, falling into the mid-70s. Malaysia Day: Celebrated annually on September 16, Malaysia Day is Malaysia's other patriotic holiday. Deepavali: The Hindu festival of Deepavali (also spelled as Diwali) is widely celebrated in Malaysia, particularly in Kuala Lumpur and Penang. Throughout winter, Malaysia experiences the rainy northeast monsoon, which brings heavy rains and strong gusts of wind. Rain mostly falls in the afternoon and evenings and is minimal on the West coast of the country, so if you're planning a beach vacation, winter is a good time. Chinese New Year: With such a large ethnic Chinese population in Malaysia, Chinese New Year is often the largest festival of the year. Dates vary from year to year; however, the festival usually hits in January or February.